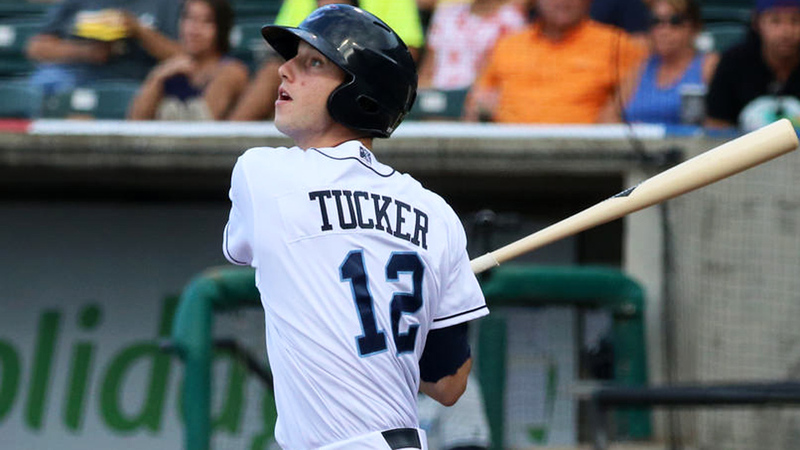 Kyle Tucker has 37 homers and 192 RBIs through his first 300 Minor League games. Kyle Tucker seems to have quickly become a fan favorite this spring. The Astros' top hitting prospect homered in three of his first five Grapefruit League games, was given a legendary nickname and became a regular in the lineup. Four months ago, however, spotlights and slash lines were far from his mind. In the Arizona Fall League, which features elite prospects and added scrutiny, Tucker hit .214/.305/.310 with no homers in 22 games. Fans and analysts may have been concerned, but MLB.com's No. 16 overall prospect wasn't too bothered. "He's the kind of guy that wants to do something that will benefit him in two years," said fellow Astros prospect Myles Straw, who considers himself one of Tucker's best friends. "Hitting .300 in the Fall League wasn't his priority at the time. He's the kind of guy that he'd rather fix his swing against quality pitching to where he can play in the big leagues." In many ways, 2017 was a breakout year for Tucker. After beginning the season with Class A Advanced Buies Creek, the 2015 first-round pick advanced to Double-A Corpus Christi at the age of 20, earned a spot in the All-Star Futures Game and was named the Astros' Minor League Player of the Year. After figuring out "that you can't really top-spin too many home runs," Tucker focused on staying through the ball and giving backspin to his pull side. The left-handed hitter finally saw the plus-power he always knew he had as he posted career highs with 25 homers, 33 doubles and 90 RBIs. It wasn't just how many homers he was hitting but when he was hitting them that so intoxicating for fans. Ever since their first season together in 2015, when Tucker belted three jacks in six playoff games for Rookie-level Greeneville, Straw has enjoyed his view of the power show, usually batting one or two spots higher in the lineup. "He's really impressive as a hitter," the Astros' No. 21 prospect said. "You don't see a lot of [bats like his] in the Minor Leagues, so having a guy like him on your team is always really special." As Class A Quad Cities manager in 2016 and Buies Creek's skipper last season, Omar Lopez saw Tucker touch 'em all more than a few times. Thinking back, he most remembers a deep shot at the end of a long game. In a cold, May contest at Carolina, Tucker came up in the 14th inning against Quintin Torres-Costa, a hard-throwing lefty. Not needing to be "the guy," the Florida native just wanted to get on base for the next batter. He ended up drilling a go-ahead blast and rousing a tired dugout. "A lot of people talk about how his swing path is a little bit different," Lopez said. "But he finds his way to put his barrel on the ball. Every time when he puts the barrel on the ball, he's doing damage, regardless if he's out of the park or the gap." After Tucker was promoted to Corpus Christi at the end of May, he homered in his second game to let the Texas League know his power was going to carry over. He battled a back injury that put him on the disabled list for nine days, then smacked a ninth-inning blast in his first game back. And as the season wound down and the Hooks chased a playoff spot, the outfielder left the yard seven times over the final three weeks. While Tucker was finding his power stroke, there were holes in his production. In his second full season, he saw drops in his batting average (.274) and on-base percentage (.346) while his strikeout total climbed to 109. "Some of our hitting coaches told me, 'Hey, you know you need to work on your swing decision and pitch recognition' and stuff like that," Tucker said. "I'm pretty good at recognizing pitches, but last year I would chase more than I would like." So the left-handed hitter went to Arizona with a plan. Reunited with Lopez (who managed the Mesa Solar Sox), Tucker was determined to be more selective at the plate, even if that meant weeks of rough stat lines. Sticking with his mentality of looking at what will benefit him in the long run, the younger brother of Braves outfielder Preston Tucker began to learn his strike zone better and track which balls he would chase out of the zone. "I know there's scouts there and they look at your performance, but I was more worried about what I needed to do for this season to get better for the rest of my career," he said. "I think just going to that Fall League and working on some stuff against good competition really helped out." Keeping with the approach through the offseason and after he arrived at Astros camp in West Palm Beach, Tucker said he made sure studying his at-bats was the focus of his mornings. He would translate that to batting practice and, ultimately, use his improved pitch recognition in game conditions. The results are reflecting the hard work. Tucker posted a .387 average with four homers and 14 RBIs through his first 13 games at big league camp. As Straw pointed out, the right fielder reached on a bunt single against Nationals right-hander Stephen Strasburg while taking Mets reliever Hansel Robles deep twice. "If you're not biting on those pitches just off the plate, [pitchers are] going to have to end up throwing it over the plate at some point and that's when you really want attack," Tucker said. "And that's what I've been trying to do. That's what I want to do moving forward." After one television analyst likened Tucker's unique swing to that of Ted Williams, teammates and fans have anointed Houston's young slugger "Ted." It's a nickname that caught on thanks to his hot start. And while Tucker said he'll leave the Williams-like averages to American League MVP Jose Altuve, he's enjoying the "fun and games" the moniker has created in the clubhouse. Straw said Tucker is typically one to lay low and play his Xbox or watch a soccer or hockey game, so he's happy to see his friend getting used to all the attention from big league teammates. "I'm really excited to see Tucker around these guys because Tucker is a shy guy, doesn't talk much, a smile every once in a while. And now he is smiling, he's talking more," Lopez said. "That will help him to open up more, his personality and be more involved in the fun part with the team. "When you feel comfortable and have a comfort zone, it's going to translate to the field." Williams played 328 games over three Minor League seasons before heading to Boston for good. As Tucker enters his fourth professional campaign, Houston already has been ruled out as an Opening Day option. While Lopez laughed and said, "I wish" when thinking about the slugger joining him at his new post in Corpus Christi, Triple-A Fresno is the likely destination to start the year. But with 300 contests under his belt, many observers would not be shocked if Tucker joined his [nick]namesake and made his Major League debut for pro game No. 329. "I'm going to be excited to watch him play in the big leagues as soon as possible," Lopez said. "And I think he has a pretty good chance if he keeps doing what he's been doing."